If you’re just beginning your search into eLearning authoring software, then you might be feeling a little overwhelmed. There’s a wide array of platforms to choose from and a lengthy list features to take into consideration. To make this process a little easier, we’ve created a quick comparison of the top eLearning platforms on the market today. Articulate Studio is one of the most popular eLearning authoring tools. It allows for publishing in HTML 5, Flash and to mobile devices. Lectora can incorporate animations, social media, PowerPoint and video. Although not difficult to use, it is less intuitive than some of the other eLearning software on the market The program requires no programming knowledge and can incorporate HTML5 media support. Adobe Captivate is an intuitive UI that transforms PowerPoint presentations into an eLearning platform by using actors, voices, interactions, and quizzes. It uses HTML5 publishing and can deliver content to mobile devices. When comparing the different eLearning platforms, there’s no best pick or clear winner. Each platform has different strengths and weaknesses and choosing the best software really depends on your specific needs and technical capabilities. Price: $1398 Storyline is a standalone tool with great interactivity including simulations, screen recordings, drag-and-drop interactions, click-and-reveal activities, quizzes and assessments. The software lets you publish courses for Flash, HTML5, and iPad. 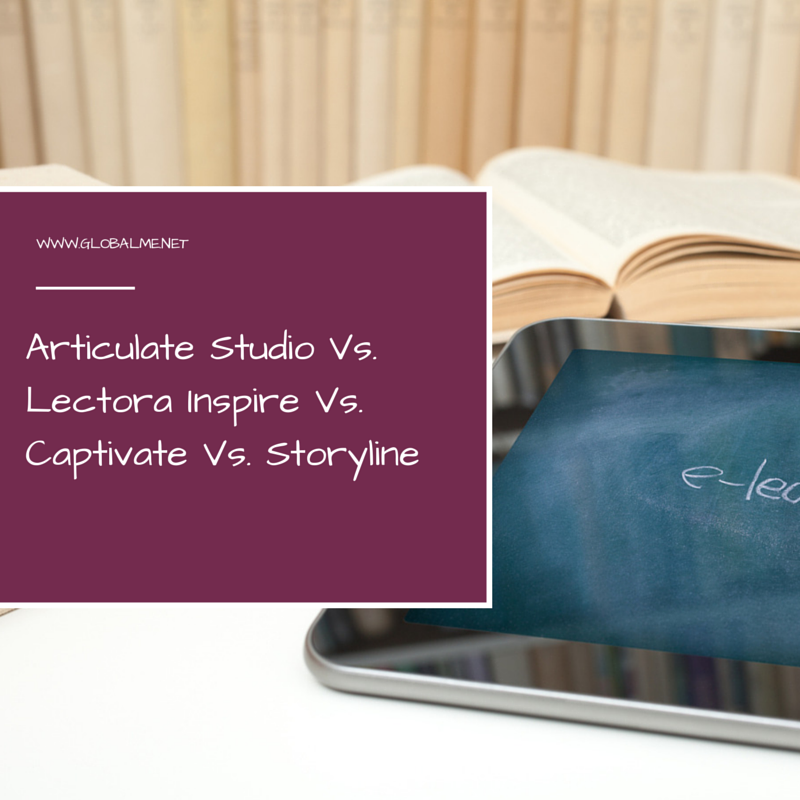 When comparing the different eLearning software and authoring tools, there’s no best pick or clear winner. Each platform has different strengths and weaknesses and choosing the best software really depends on your specific needs and technical capabilities. Still need more information? E-Learning Uncovered has a great and easy to read elearning software comparison chart for the platforms listed above. Sophie loves creating and sharing exciting content, interacting with our community and finding creative ways to show the world what we do at Globalme. Thanks for the info. I looked into the four authoring tools you have mentioned here. But they are above my budget. Recently, I have been using ProProfs Training Maker for past few months and it has been a good experience, so far. They have upgraded their features, and I found it pretty good as a free user. I am thinking about buying their subscription. It would be great if you can do a comprehensive study on ProProfs Training Maker and tell me if it’s worth my money.